The microtubule system of eukaryotic cells is a critical element in a variety of fundamental cellular processes such as cell proliferation, mitotic spindle formation, maintenance of cell shape, regulation of motility, cell signaling, secretion, and intracellular transport. Its important role in mammalian cell have made it an attractive target for the development of anticancer drugs. Because the central role of microtubules dynamic in mitosis progression and thus in cell proliferation, drugs that affect microtubule assembly are important component in combination chemotherapy for the treatment of pediatric and adult cancer. In this context we have evaluated both in vitro and in vivo different new compounds for their antimitotic activity. Therapeutic potential of FOXO3 axis in pediatric acute lymphoblastic leukemias. We investigated whether therapy resistance in childhood T-ALL cells correlates with inactivation of FOXO3. We have found that cells from prednisone-resistant T-acute lymphoblastic leukemia (T-ALL) patients showed cytoplasmic localization of FOXO3 in comparison to prednisone-sensitive patients suggesting its inactivation. We uncovered, that FOXO3 activates apoptosis. The involvement of FOXO3a in glucocorticoid resistance was also studied in B-acute lymphoblastic leukemia (B-ALL). We have demonstrated that in response to dexamethasone, FOXO3a translocates into the nucleus and elicits the expression of downstream targets important for proliferative arrest and cell death. FOXO3a activation by dexamethasone is mediated through its Ser-7 phosphorylation and Lys-242/5 acetylation. These findings expose FOXO3a and its post-translational modifications as essential for dexamethasone response, which can be exploited for B-ALL diagnosis and treatment. Potential application of new choline kinase inhibitors. Choline kinase (ChoK) is one of the most important enzymes for the generation of two major membrane phospholipids, phosphatidylcholine (PC) and sphingomyelin (SM), and subsequently for the cell division. Choline kinase is a homodimeric enzyme that catalyses the Mg.ATP-dependent phosphorylation of choline to generate phosphocholine (PCho) as the first step in the pathway. In mammalian cells, only the ChoKα isoform (synthesized by Chkα gene) has a central role in sustaining PCho biosynthesis, indeed ChoKβ alone cannot compensate this activity. Furthermore, a large number of studies in cancer cells suggests that ChoKα expression and activity are directly associated not only with increased cancer cell proliferation but also with malignancy, making it a potential prognostic marker for some cancers, such as non-small-cell lung cancer and breast cancer as well as a potential novel target for image-guided cancer therapy. The cholinic phenotype, characterized by increased ChoKα activity and expression, renders this enzyme an attractive new therapeutic target. The feasibility of ChoKα inhibition as antitumoral therapy is being pursued in our laboratory through the development of chemical inhibitors of its enzymatic activity. In this context we are evaluating the antitumor activity of new choline kinase inhibitor in breast cancer and in T-acute lymphoblastic leukemia (T-ALL). 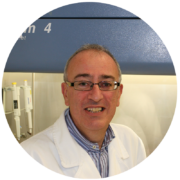 The main aim of this project is to evaluate the involvement of Nrf2 signaling in sustaining therapy resistance and relapse in medulloblastoma (MB) and to explore the possibility to develop Nrf2 inhibitors potentially able to increase chemosensitivity in MB. To this end, we will recapitulate in vitro the chemotherapy-induced evolution of MB cells by applying conventional therapy-dependent pressure to cells and subsequently screening the intracellular events, linked to Nrf2, activated by remaining MB cells. Moreover, we will evaluate metabolic changes dependent on the transcription of Nrf2 target genes and miRNAs. The final aim will be the identification of small molecule able to inhibit Nrf2 transcriptional activity and to increase the effect of conventional chemotherapy.